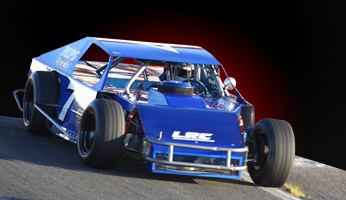 LRC modified chassis have evolved a great deal over the past decade. We have moved from using Ford front clips to the popular GM frames. We offer two frame options. The 68-72 Chevelle frame and the Metric Impala frame are the choices that we offer. Our chassis are both built on a surface plate fixture. We use high grade D.O.M. tubing in the construction of our cars. The rear clip assembly is a bolt on unit for easy replacement. The clip is also designed to be a crush barrier in the event of a hard rear impact. The fuel cell is fully contained within the structure with protective bars beneath the cell. The front suspension has correct geometry utilizing slug upper mounts for easy changes. Our design uses slotted shaft upper control arms for easy alignment. The rear suspension has slotted radius rod mounts and round clamp bracket posts. We use a three link design with a multiple mounting point panhard bar. The rear springs may be conventional weight jack or coil over. Our chassis are custom fit to each drivers needs. Seat mounts, brake pedal mounts, and steering shaft assemblies are not installed until each chassis is sold so we can custom fit each driver. The basic chassis includes ; all front and rear suspension mounting points, bumper and nerf bar mounts, bolt on rear clip, engine mount plates, radiator mounts, seat base mounts, brake pedal mounts, and cockpit floor pan.